Schiller AG - The Art of Diagnostics with an extensive experience in the ECG domain has developed the leading edge cardiac assessment system – cardiovit CS 200 Excellence. This innovative ECG diagnostic system from Schiller offers highly scalable solutions and is designed to high-volume workload. Being a pioneer in the computerized ECG measurement and interpretation, Schiller has never failed to exceed the expectations of medical community. Schiller CS 200 Excellence housed with the newest 3rd generation core i7 CPU delivers results in the fastest and most efficient manner. Catering to the unique performance and productivity requirements, Schiller’s cardiovit CS system has set new standards in the field of electrocardiography. During an exercise stress, the cardiopulmonary system works harder to meet the increased oxygen demands. ECG response and development of angina during the exercise test allows the physician to evaluate the risk of coronary artery disease. Schiller’s Cardiovit CS-200 excellence unit comes with an automatic ECG measurement system and interpretation feature which accurately measures recorded cardiac signals. Integrated with the cutting-edge HyperQ technology, Schiller’s cardiac stress test equipment helps the doctor to detect and evaluate coronary artery disease and acute coronary syndrome. 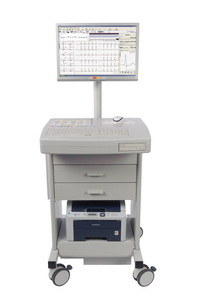 Cardiovit CS-200 Excellence diagnostic system is built with powerful hardware units and software applications. Its 24-inch LCD monitor provides rich-onscreen information content with customizable display layout. As the Schiller ECG machine can be integrated with any network, you can have seamless connectivity to EMR, SEMA cardiology information systems and PACS. Moreover, clinically verified algorithms of the CS-200 unit provide interpretation statements for the evaluation of exercise and resting ECGs for both adults and children. QT dispersion, rhythm ECG recording and thrombolysis software present in the CS -200 Excellence allows the physician to calculate the probability of coronary risks among the patients. Compact and concise system with 12-channel ECG is especially designed for enterprise hospitals and clinical practice. Schiller medical equipment with high-performance analysis, innovative network solutions and multifunctional diagnostic tools saves time and boost the overall productivity.